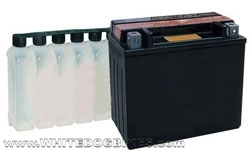 Maintenance free or sealed motorcycle batteries are usually supplied with the acid seperatly then once the battery is filled and the cap is placed in the top no further monitering or topping up of the acid is required. Maintenance Free or Sealed motorcycle batteries reference numbers usually start with the letters YTX, CTX or GTX (e.g YTX9-BS). Where 2 battery references are next to each other with 1 set in brackets, For example YTX4L-BS (CT4L-BS), this indicates both batteries are the same.